Manage and catalog your DVD collection. 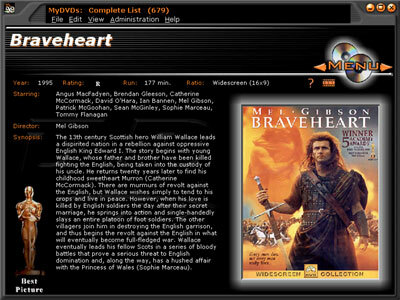 Information for most DVDs can be found and retrieved from the Web by title including cover images. It stores title, year, rating, runtime, actors, director, genre, synopsis, special features, notes, owner, and purchase date. You can search through DVDs by most fields, find and play trailers from the Web and also print and export DVD lists. The interface has a presentation look and feel so it can be used when you're home or have company and want to decide what to watch. Hot keys are also setup to scroll through DVDs so for those with remotes for their PC, and for those that have video out to connect to your TV, you can sit back on the couch and scroll through your DVDs using the previous and next buttons on your remote.